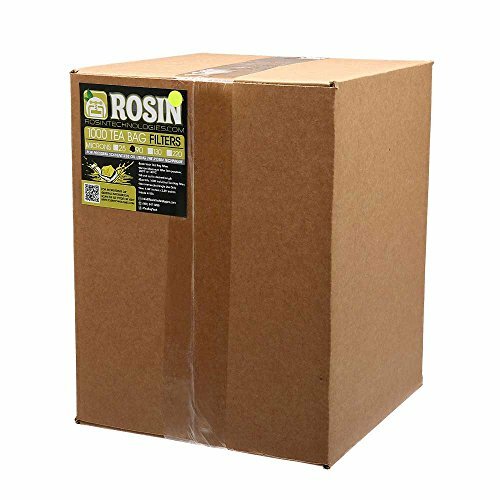 Rosin Technologies 90 micron Thin and Skinny Rosin Filters (1,000 Pack) by Rosin Technologies at Jakis Cafe. Hurry! Limited time offer. Offer valid only while supplies last. Thin & Skinny Tea Bag Filters by Rosin Technologies are specially designed 90 micron screens for pressing solventless oil using the Rosin Technique. Thin & Skinny Tea Bag Filters by Rosin Technologies are specially designed 90 micron screens for pressing solventless oil using the Rosin Technique. These filters are specifically sized to fit the puck made with the Thin & Skinny Rosin PrePress Mould. This pairing provides the operator with a great method for fast and consistent packaging. Use the open side of the filter sleeve to insert your flowers or dry sifted material. Fill and cut filter sleeve to desired length. The 3.25" x 1.25" single use Rosin Tea Bags are intended to hold 3 - 5 grams and withstand temps up to 300ºF. If you have any questions about this product by Rosin Technologies, contact us by completing and submitting the form below. If you are looking for a specif part number, please include it with your message.